Flowering rush is a reed-like wetland plant with pink flowers. Leaves are tall, extend from the roots, and are dark green in color. Leaves have a triangular cross-section and tend to twist near the tip. Flowers comprise of three pink petals and three sepals arranged in clusters or umbels (umbrella shaped) on a flower stalk. Flowers typically bloom in June through early fall. Small buds that form in the clusters of flowers can disperse and grow into new plants. Populations in the eastern United States produce seeds. Only one Minnesota population in Forest Lake (Washington County) is known to produce viable seeds. All other flowering rush populations in Minnesota are sterile and reproduce by vegetative spread, not seeds. Roots are bulb-like and appear to “hug” or cup one another. The plant reproduces by vegetative spread from its rhizome (an underground stem that sends out roots and shoots from its nodes) in the form of small onion-like buds (bulbils). Bulbils can detach and spread through water currents. Individual pieces of the rhizome can also break off and produce new plants. Flowering rush is a perennial plant that grows one to four feet high along shores in shallow, slow-moving water. In deeper water, it can grow in a submerged form that does not produce flowers. It flowers in early summer through mid-fall. 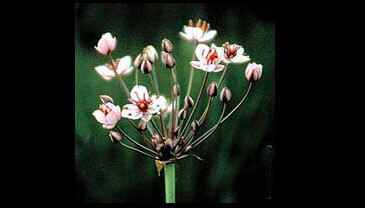 Flowering rush is native to Europe and Western Asia. The first discovery in North America was in the St. Lawrence River in 1897. The species was unintentionally introduced into the United States’ Great Lakes through the discharge of contaminated cargo ship ballast water. The species was commonly imported and sold by the water garden trade, leading to the potential for illegal release into the wild. Flowering rush was first confirmed in Minnesota in 1968. Refer to the infested waters list for current distribution. Flowering rush is difficult to identify when not in flower, as it closely resembles many native, beneficial shoreland plants in Minnesota, such as the common bulrush. Flowering rush (Butomus umbellatus) is a prohibited invasive species in Minnesota, which means it is unlawful (a misdemeanor) to possess, import, purchase, transport or introduce this species except under a permit for disposal, control, research or education. Invasive species cause recreational, economic and ecological damage--changing how residents and visitors use and enjoy Minnesota waters. People spread flowering rush primarily through movement of water-related equipment and illegal release of water garden plants into public waters. The small rhizome buds, or bulbils, can be hidden in mud and debris, and can stick to boots, waders, and other fishing and hunting gear. Report new occurrences of flowering rush to the DNR immediately by contacting your DNR Invasive Species Specialist or log in and submit a report through EDDMapS Midwest. Mechanical control can be done by cutting the plant below the water surface several times per summer and removing all cut parts from the water. However, in some instances, cutting has facilitated spread. Hand digging is best for small infestations, especially when water levels are low. Hand dig isolated plants with care, as root fragments can spread and sprout. Herbicide control can be done using imazapyr herbicide. Preliminary testing indicates that a mid-summer application during calm wind conditions may be most effective.